In my previous Experts Exchange Articles, most have featured Basic and Intermediate VMware and Virtualisation Topics. This tutorial does assume some basic VMware knowledge. This tutorial shows how to create a test lab environment to test and demonstrate VMware vSAN, and to take it for a test drive. It's not recommended that this lab be used in production environment. This is not to be confused with the previous VMware vSphere product VMware vSphere Storage Appliance (VSA), which is based on a Virtual Appliance hosted on VMware vSphere (ESXi). VMware Virtual SAN (vSAN) is built into the VMware vSphere (ESXi) 5.5 vSphere kernel. 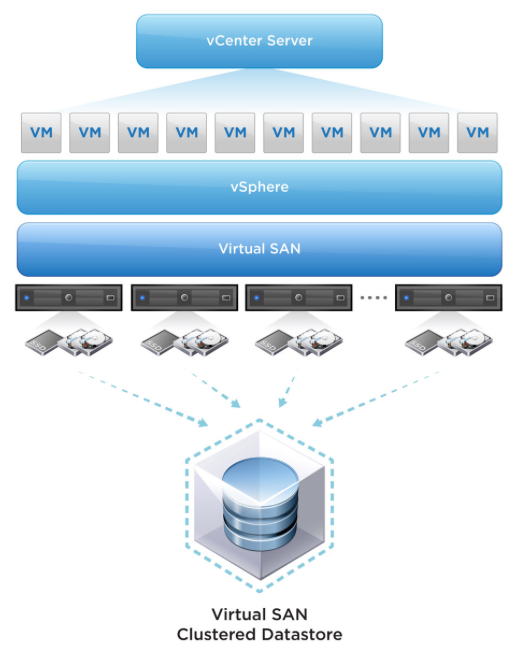 Both VSA and vSAN are similar in concept; they are both virtual but their similarities end there. vSAN provides better scalability, resilience and availability than VSA, (vSA does not scale beyond 3 hosts), and vSAN scales out better for virtualized/cloud environments, it's aimed at the Enterprise or Commercial vSphere customer. vSAN requires a minimum of three hosts for deployment, and supports SSD read and write buffering (caching). At least one SSD and one conventional magnetic hard disk drive are required per host for deployment (1 SSD, 1 HDD per host x 3 minimum). SSD caching is not supported in VSA. You cannot at present use all SSDs for a vSAN. What is VMware Workstation ? VMware Workstation was VMware's first product, launched in May 1999, a Hypervisor application for Intel or AMD 64 bit processors. The current version is 11 at the time of writing this article (December 2014). It allows users to setup one or more guest machines on a single host computer. A guest machine is often referred to as a virtual machine. VMware Workstation is a type 2 hypervisor. It's an application that installs under a Windows or Linux OS and requires a Windows or Linux OS to be present to function. Other current type 2 Hypervisors include VMware Player 7.0, Oracle Virtualbox 4.0, VMware Fusion 7.0 and Parallels Desktop 10 for Apple Mac OS X. Type 2 hypervisors can be considered slower than a type 1 hypervisor. However, with the advent of faster desktop processors e.g. Intel i3, i5 and i7 processors, there are far more idle host CPU clock cycles available to allow virtual machines to function. On today's modern laptops and workstations we can run many virtual machines in VMware Workstation with little performance degradation, compared to running the computers on bare metal. This makes VMware Workstation the ideal application and hypervisor to use for creating sophisticated test suites and labs if you do not own the physical hardware. Even if you do have the physical hardware, it's a great tool to have installed on a laptop to carry your lab around or test break and fix scenarios. All our laptops and desktop workstations have copies of VMware Workstation installed for this use. In this Experts Exchange tutorial, I’m going to take time out from writing a Basic VMware Article, and show you HOW TO: Set up a lab environment for vSAN using VMware Workstation. I'm using VMware Workstation, because we need a minimum of six virtual machines for this lab. I'm also going to use vSphere 5.0 AutoLab 2.0 by fellow VMware vExpert - Alastair Cooke. 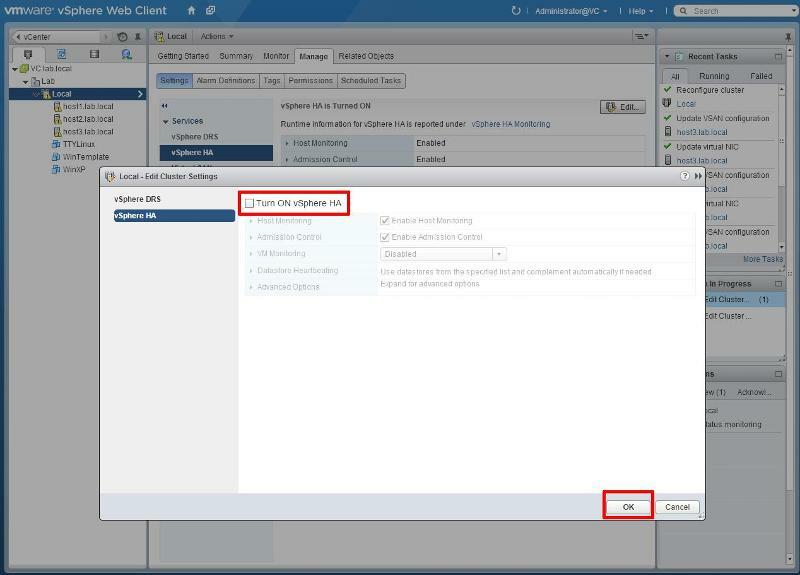 This allows the quick deployment of a VMware vSphere 5.0 Clustered environment. 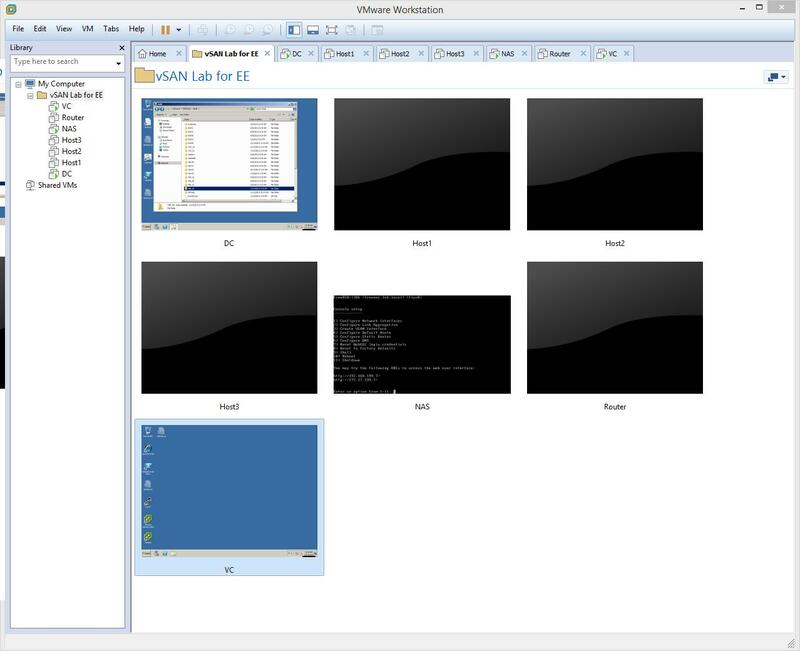 The AutoLab is a quick easy way to build a vSphere environment for testing and learning using a single desktop or laptop PC and VMware Workstation, Fusion or ESXi. The whole lab runs in VMs on that one PC; Even ESXi runs in a VM and can then run its own VMs. With the release of AutoLab 2.0, VMware vSphere (ESXi 5.5) 5.5 is supported, and we can enable vSAN. Intel Dual Core 64 bit CPU (with Intel VT or Intel virtualisation enabled) or AMD CPU with virtualisation enabled. the following software products are available as free downloads and/or 30/60 day trials. 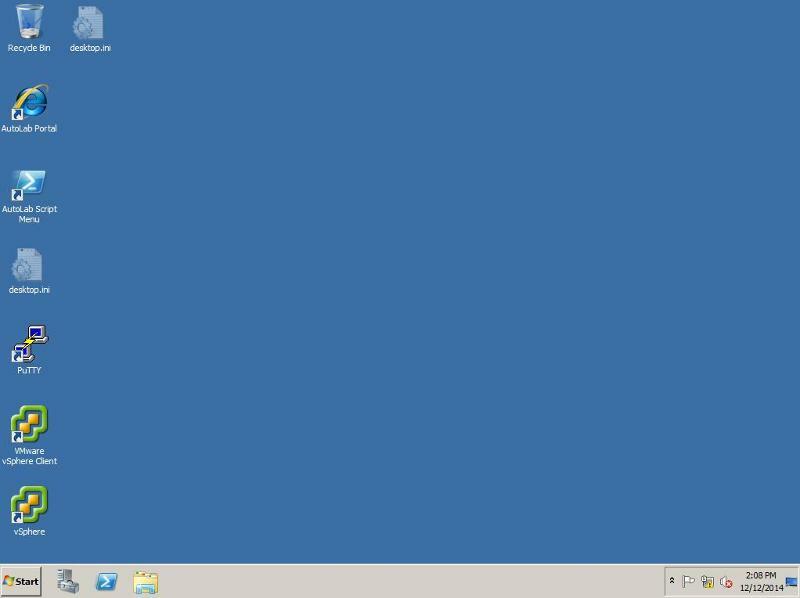 Installation of VMware Workstation and vSphere 5 AutoLab 2.0 Software, and Lab configuration. Install and Configuration of VMware vSAN. 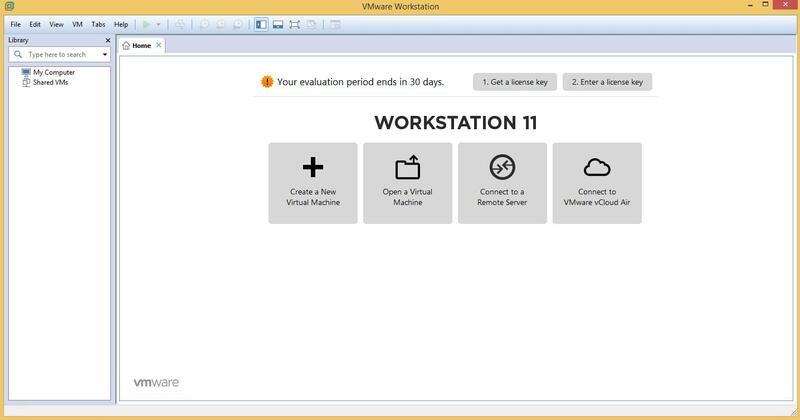 PART A - Installation of VMware Workstation and vSphere 5 AutoLab 2.0 Software and the Lab configuration. Download the vSphere 5.0 AutoLab 2.0 Deployment Guide. Alastair has provided an excellent guide to work through to setup AutoLab 2.0, so I'm not going to repeat all the steps required to setup AutoLab 2.0, but I will provide some examples, and pitfalls to avoid. The first-time AutoLab deployment takes approximately three hours to complete, but re-deployment is much quicker. Login as a local administrator on your computer, and download and install VMware Workstation 11.0. 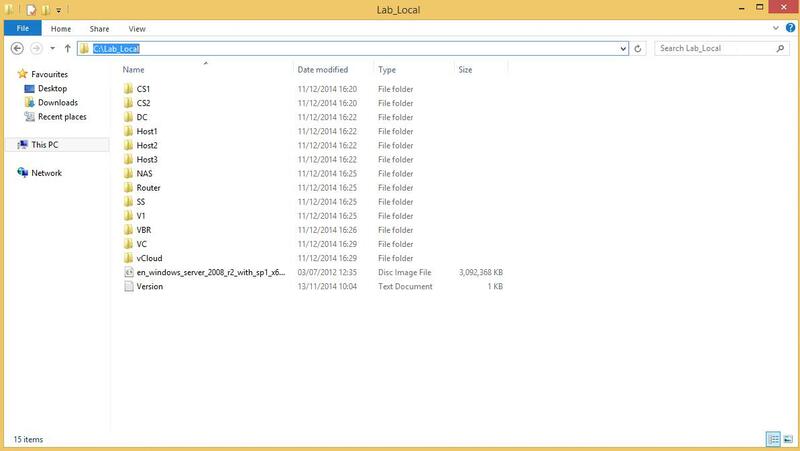 Download the vSphere 5 AutoLab 2.0 Software, and un-archive the software archive into the C:\Lab_Local folder. 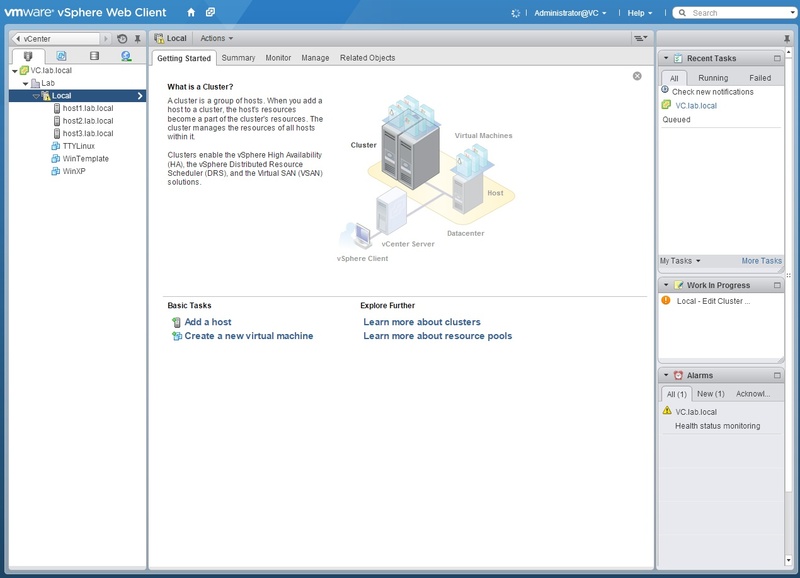 Create the Lab network as shown in the Deployment Guide. 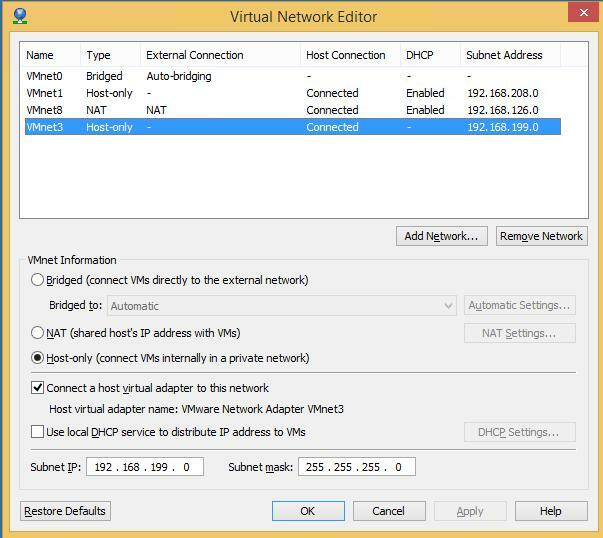 You will need to run the Virtual Network Editor as an Administrator (Run As Administrator). Task 1 – Prepare the prebuilt VMs Page 23 of the vSphere 5.0 AutoLab 2.0 Deployment Guide. Vitual Machines opened and powered on. Task 2 – Build DC, Windows Infrastructure - Page 27 of the vSphere 5.0 AutoLab 2.0 Deployment Guide. Use the Validate script icon to check the Lab Build has been completed successfully. Task 3 – Build ESXi servers - Page 30 of the vSphere 5.0 AutoLab 2.0 Deployment Guide. Deploy three ESXi 5,5 (u0) Hosts, Host1, Host2 and Host3. Task 4 – Build VC, vCenter server - Page 31 of the vSphere 5.0 AutoLab 2.0 Deployment Guide. Task 5 – Populate vCenter - Page 33 of the vSphere 5.0 AutoLab 2.0 Deployment Guide. Use the Add ESXi hosts option from the menu in the AutoLab Script Menu. Open the URL - https://192.168.199.5:9443/vsphere-client/ on the host PC web browser or using the AutoLab Portal icon on the desktop on the vCenter Server. Login with the account details provided in the deployment guide. You should see the following "Welcome to the VMware vSphere Web Client" screen. Click the vCenter icon, to confirm the Lab has been completed successfully, and check vCenter, Cluster and Hosts are present. Click Host and Clusters and check that you have a Cluster called Local, and three hosts present: Host1, Host2 and Host3. 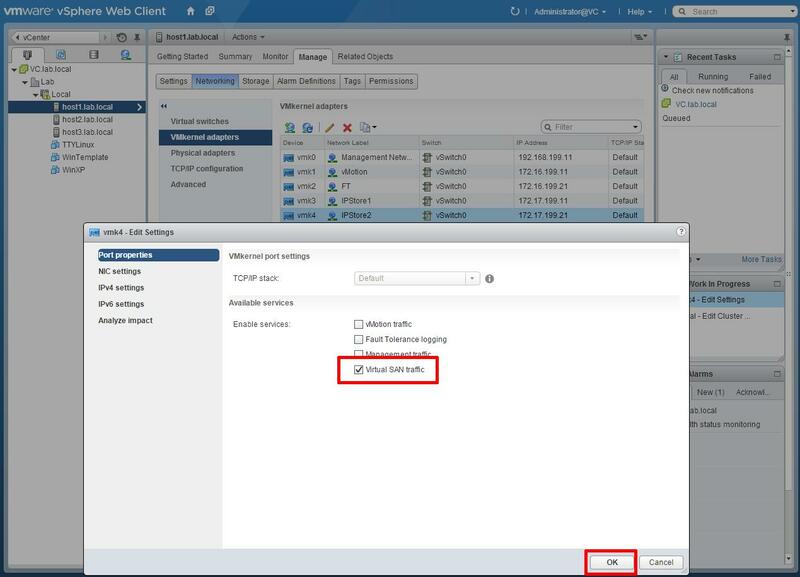 PART B - Install and Configure VMware vSAN. We need to perform some customizations to our lab cluster Local and hosts before we can enable VMware vSAN. We need to enable a VMkernel interface on each host for vSAN Traffic. Each host has 4 VMkernel Interfaces, select and edit vmk4 - IPStore2, and enable for Virtual SAN traffic. 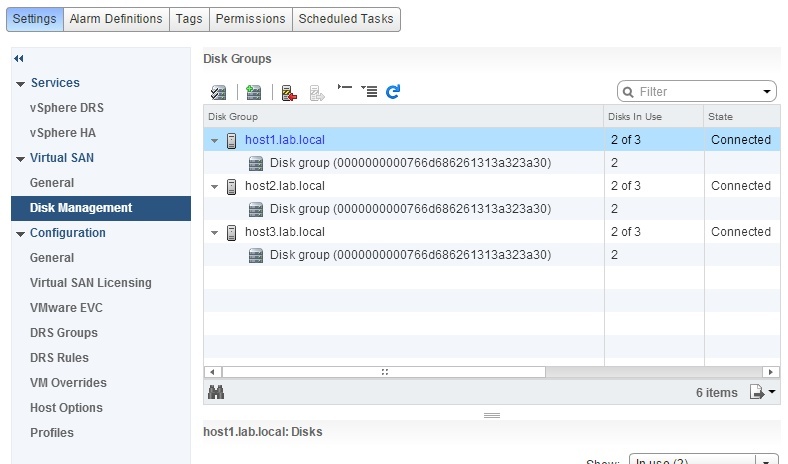 Repeat for host2.lab.local and host3.lab.local. 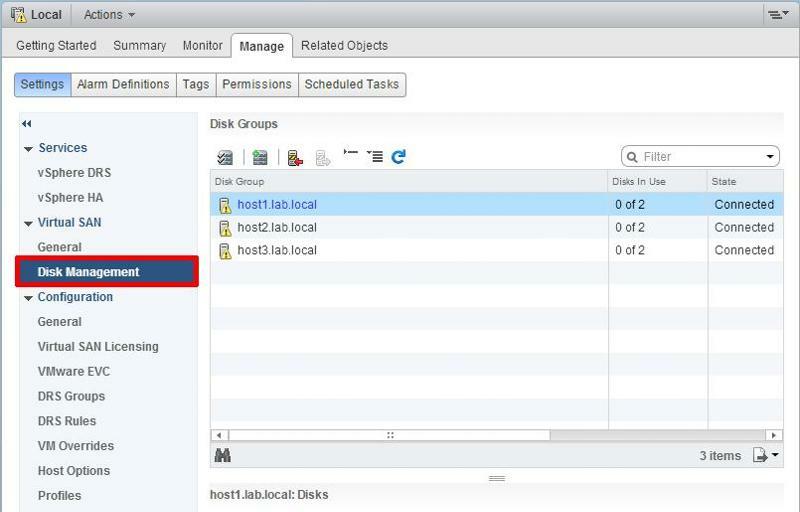 Select the cluster Local, and select the Manage tab, then vSphere HA, select Edit, and remove the Tick from Turn ON vSphere HA, to disable vSphere HA on the Cluster. 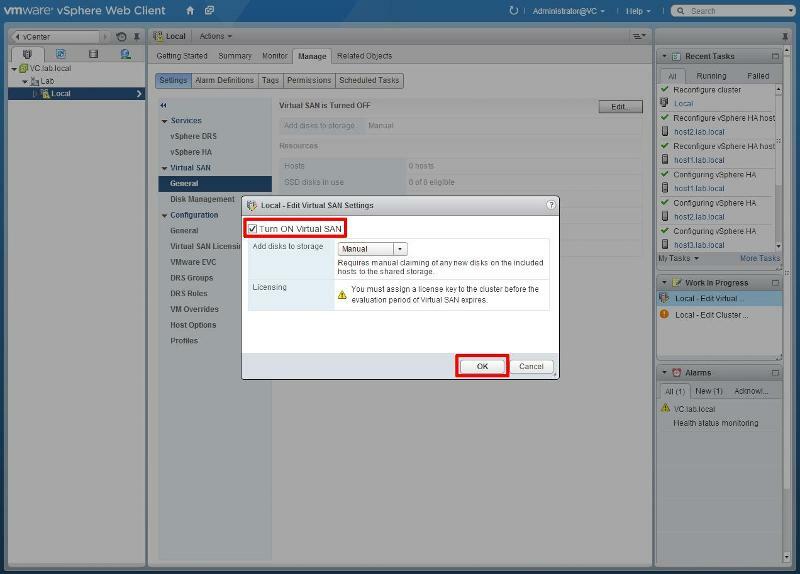 Click Virtual SAN (underneath vSphere HA) > General, select Edit and Tick the box to Turn ON Virtual SAN. Leave Add disks to Storage set to Manual. We will add the disks manually. 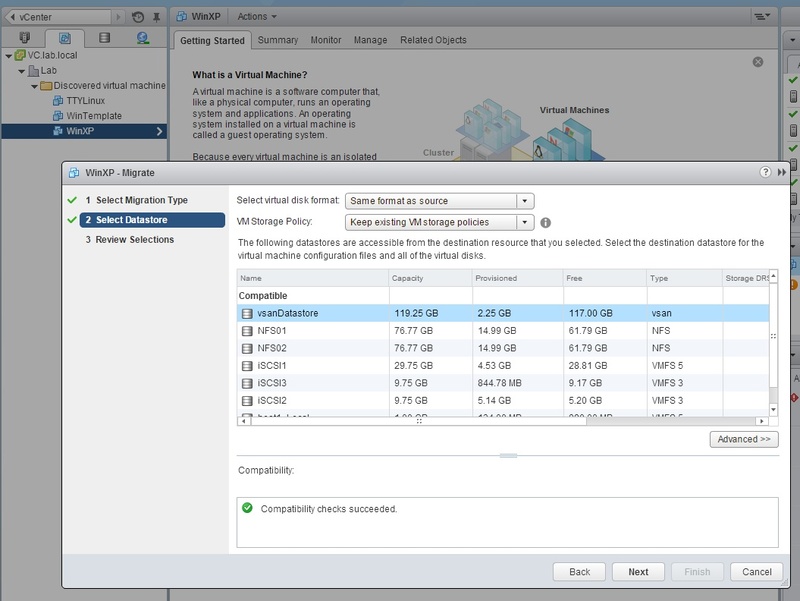 If you select Automatoc - vSAN will select all eligible disks for you and add them. We now need to add disks to Disk Groups. A Disk Group contains at least one SSD, and one HDD (non-SDD) drives. Each host in the lab has already been provisioned with three local SSD disks (emulated/fake SSDs), two of which are not used or claimed by the host (meaning they are not used as a VMFS datastore, flash cache or host cache storage). 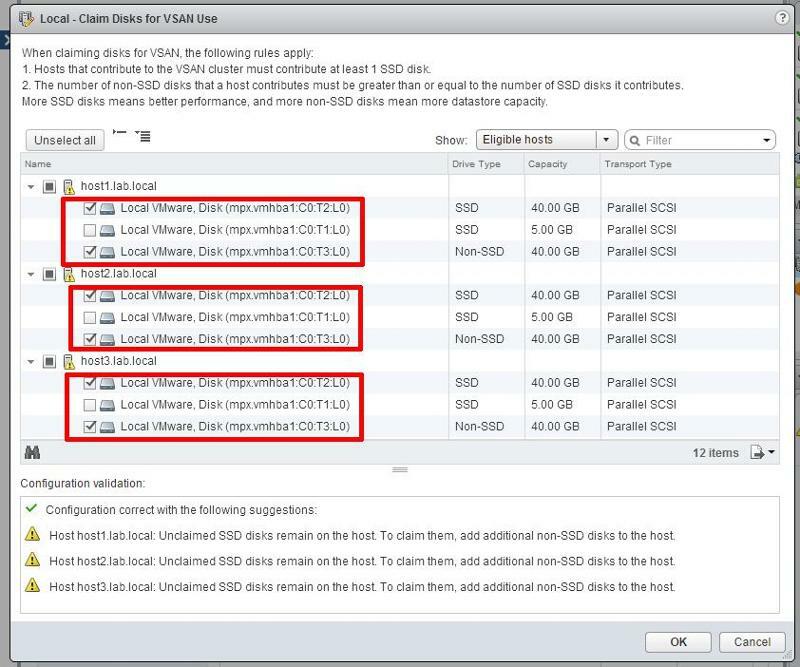 If you continue without the next modification to your hosts, there will be no disks to claim for vSAN, because vSAN cannot be populated solely with SSDs! SSDs are used as read and write buffers (cache) for slower magnetic HDDs (non-SSD). vSAN is similar to hybrid storage. You will need to tag a virtual disk as non-SSD, by adding the following line to the hostx.vmx file. This needs to be done when the host is powered off. At this point it's also worth increasing the RAM in the hosts to a minimum of 6GB, the minimum for vSAN. in this tutorial, I've added another fourth virtual scsi disk, of 40GB, and tagged it as a Non-SSD. Click the Claim Disks icon, and select the Disks to use in vSAN. Select a 40GB SSD and 40GB Non-SSD (or disk you have added above). Repeat for all hosts, or click the Select all eligible disks, and all eligible disks on all hosts will be selected for you. 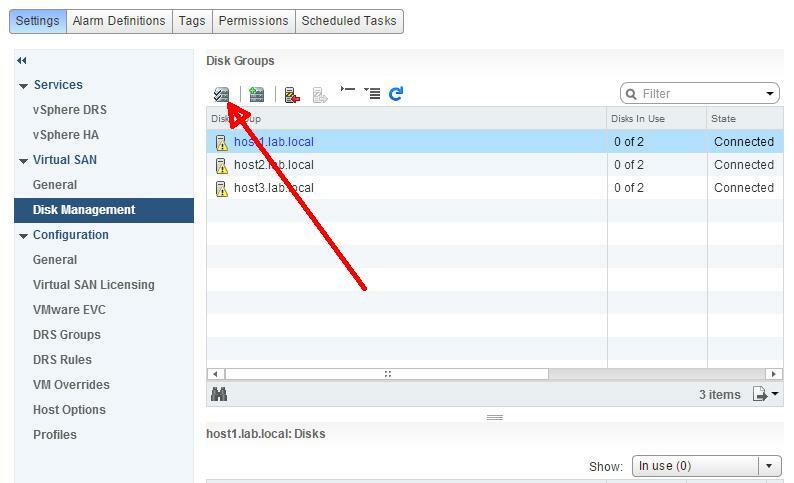 Once you have selected the required disks for vSAN, Click OK. You can always add more disks to the group later. The Disk groups will be created automatically, consisting of 1 x 40GB SSD and 1 x 40GB non-SSD. You have now created a new vSAN datastore called vsanDatastore. Select Storage from the main menu. You can use this new datastore, like any other traditional datastore, create a new virtual machine on it, or migrate an existing virtual machine to it. 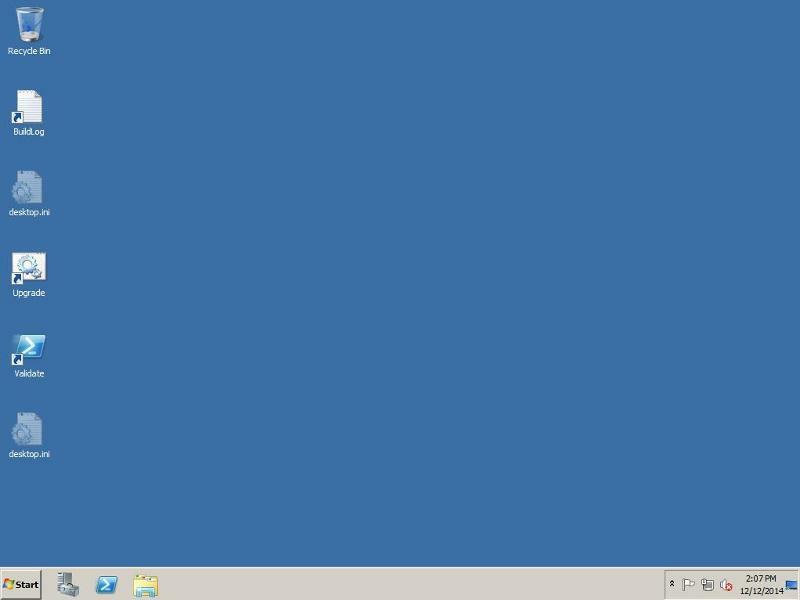 Select the WinXP virtual machine in the inventory, and migrate it to the vsanDatastore as a test. The WinXP virtual machine was successfully migrated to vsanDatastore. 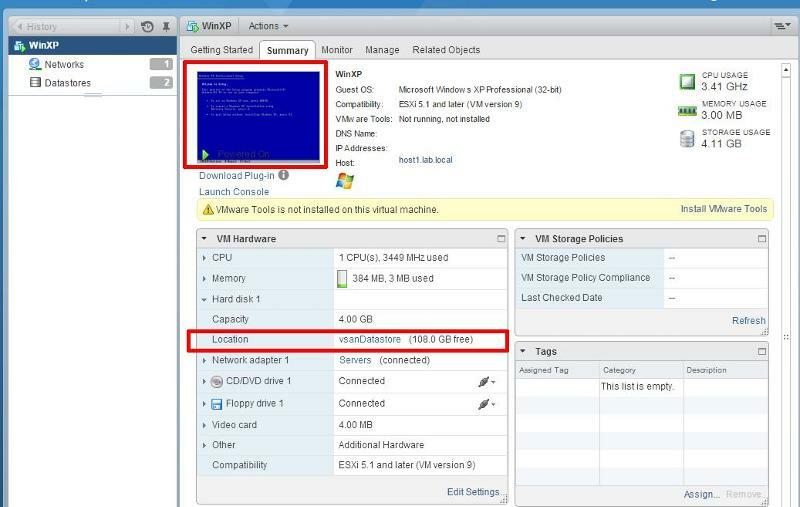 WinXP virtual machine, powered up, and resident on the new vSAN datastore vsanDatastore. Congratulations you have installed VMware Workstation and completed the setup of vSphere 5 AutoLab 2.0, and installed and configured VMware vSAN. Now you have completed the setup of vSphere 5.0 AutoLab 2.0, you will be able to quickly deploy new labs in the future. 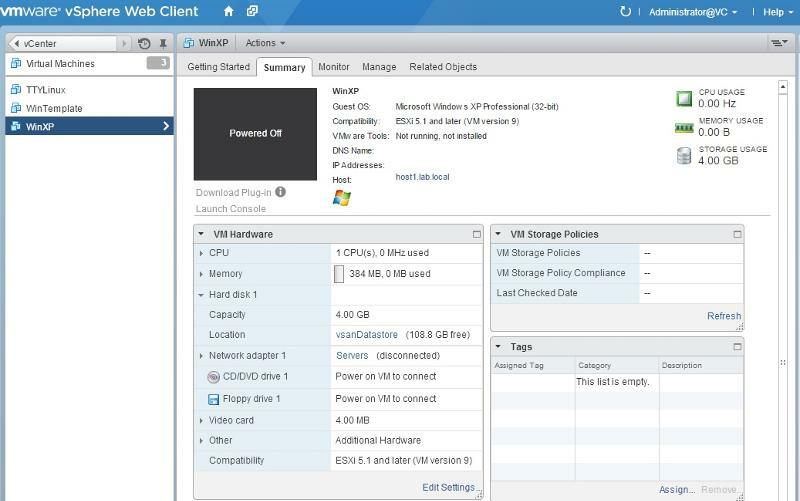 VMware for the use of vSAN and VMware Workstation images. Alastair Cooke for the use of VMware 5.0 AutoLab 2.0 in this article.